Clk with chrome wheel arches? Discussion in 'General Mercedes-Benz Related Discussion' started by xtriple, Jun 12, 2018. 208 Convertible 320. Vauxhall Astra estate (yuck!) Jeep Cherokee 4.0. Right, I am prepared to be roasted here, but hear me out... I have '99 CLK 320. It has blobs of rust round three of the four wheelarches, really, as is to be expected. The car cost £1800 and I have spent a bit on it getting it all working properly so now my mind turns to the rust. 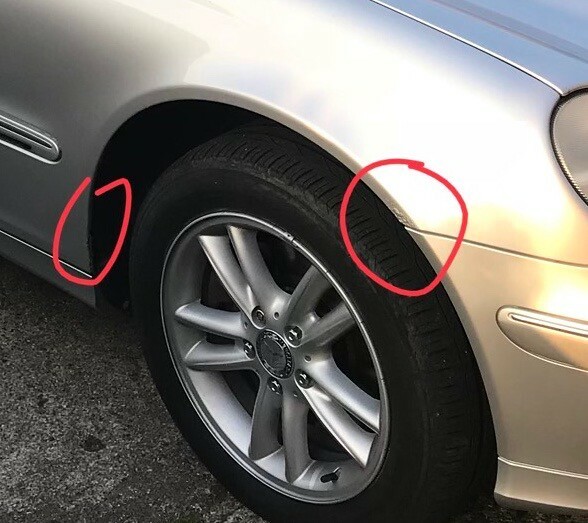 I shall ask a local bodyshop how much to repair and paint properly (and the bumpers) but, I thought a cheap alternative would be the chrome arch kits available for £60 ish. I have to admit, I am not a fan of them but wondered if they would suit a CLK. Also, I could deal with the rust blebs, treat, paint and then pour Waxoyl inside them and then put these arches over the top which should protect them. The car is Metallic Black Opal so quite dark, any thoughts on if this would spoil the car or maybe, improve it? I Also have a 99 208 320 Covertible, bought it 18 months ago and spent £1000 on new wings and arches, I know I won't get that money back when I sell it but plan to keep it for a few years anyway so what the hey. I have since done a lot of suspension work myself and from poking around underneath I think it would be fairly easy to replace the front wings yourself, they cost about £140 each, then get a bodyshop to sort out the rear arches and give it a cheap respray. Regarding your actual question I also briefly considered chrome arches but rejected them on the basis that they look a bit naff. silestanix and xtriple like this. They do indeed. I thnk I will go the re-spray route, just trying to save money as a tad broke at the moment! Likewise ^^^ if you don't mind me saying, they do look a bit naff, almost pikey. Good idea in theory you could spray them any colour. I have a similar issue on my S203. I have a quote from a local bodyshop which came in at over £1500 for four wings. This pic is indicative of the others so pretty minor I assumed. I'll probably do it myself as I didn't pay that for the car but will get another quote. I sprayed them body colour for a 210...though never fitted them. Any MB with chrome wheel arches just looks wrong. It seems the concensus is: 'NO!' I do agree, just hate rust and broke... but I rang my favourite, very good body man yesterday, he is coming to see it on Thursday?Friday and is keen to do the job. Just down to cost now. It's a nice car, probably worth it, but I do need to watch the pennies just now. Never mind that. liking your profile pic ! Yep as said the chrome arches look naff, and are only usually fitted to hide the rust. In my opinion, I would watch how much you spend on the car, as the newer W209 cabriolets are a much better car, and not a lot more expensive. I've seen some of the big petrol models, 240, 380, 320 etc with sensible miles, going for between £2 -3k, so is it worth spending too much on your W208? Yes some W209s are rusty, but they are generally better than the W208. I cant see you getting much change out of £1k for a decent job. I know that ultimately the car is not worth a lot, but I really quite like it and so my desire to convertible on a budget has sort of flown away! I need the four seats (dogs in the back) so there really is not a lot of options out there unless I get a SAAB or Volvo version... I'd rather carry on with the MB! I may keep it long term and wait until it's a classic and worth 'Millions' before selling it or upgrading I do tend to fall in love with stuff and then spend way more than the item is worth on 'restoring' them. I'm just as bad with bikes and watches! Even if you could manage to get up to Bristol, I'm sure you could find a w209 cabriolet for a good price. Unless your car is in excellent condition and low miles it's never going to be a classic worth a lot. I'd recommend running it for a few months before investing too much, in case it has mechanical issues to fix first. Use Buzzweld on them. I did the wife's Spitfire bulkhead and am happy to recommend it. Agreed, I did the same with mine, you can't always be governed by resale value, rather if you will get your monies worth from the car over a period of years, not saying that the W208 is a classic but how many future classics have been scrapped over the years because they were "not worth repairing" I know I've owned a few that I wish I still had. Also I don't like the shape of the W209 as much especially the convertible.